Medical writing is an art which requires a fine blend of new scientific information and rhetorical skills. An article in a reputed journal ensures recognition and career advancement, and there has been a rush among doctors to publish their research work. Several indexed “predatory” journals have mushroomed and are accepting articles without a blinded peer review. The standard impact factor (IF) scoring for a journal has been debatable and so has been the authenticity of indexing. Awareness regarding standard guidelines is required for reliable and valid research. Evidence from a scientific research is the need of the day for an emerging economy like India to help build universal health coverage and meet sustainable developmental goals. This article analyses the concepts of IF and indexing and discusses the best practices for the editors, peer reviewers, and authors. Introduction: Levamisole, a synthetic imidazothiazole derivative has been used as a steroid sparing agent in children with Frequently Relapsing Nephrotic Syndrome (FRNS) and Steroid Dependent Idiopathic Nephrotic Syndrome (SDNS). Levamisole has been essentially considered a safe drug with minimal toxicity. We conducted this study to re-examine the safety of Levamisole in children with nephrotic syndrome and to describe the clinical profile of these children. Materials and Methods: Records of children with idiopathic nephrotic syndrome between June 2014 and December 2016 were reviewed. We identified frequently relapsing or steroid dependent children between 1-18 years of age who had received Levamisole for at least six months or in whom Levamisole was started but had to be withdrawn due to some adverse events in the first 6 months. Results: 21 children were started on Levamisole in the study period. 13 (61.90%) were FRNS and remaining had a steroid dependent course. Levamisole had to be withdrawn in one child at 1 month 13 days after initiation when the child developed severe headache. Levamisole also had to be discontinued in a 9 years old girl at 13 months after initiation of therapy due to polyarticular arthralgia involving both the small and large joints. Conclusions: The use of Levamisole warrants caution in children with Nephrotic Syndrome and its efficacy needs to be balanced against its potential side effects. Objective: The objective of the study was to compare the outcomes of the incidence of nausea/vomiting and other complications along with the time taken for discharged in patients undergoing Thoracic Epidural Analgesia (TEA) and General Anaesthesia (GA) for breast oncological surgeries. Background: GA with or without TEA or other postoperative pain-relieving strategies remains the traditional anesthetic technique used for breast oncological procedures. We initiated the use of high segmental TEA for patients undergoing these procedures in our hospital. 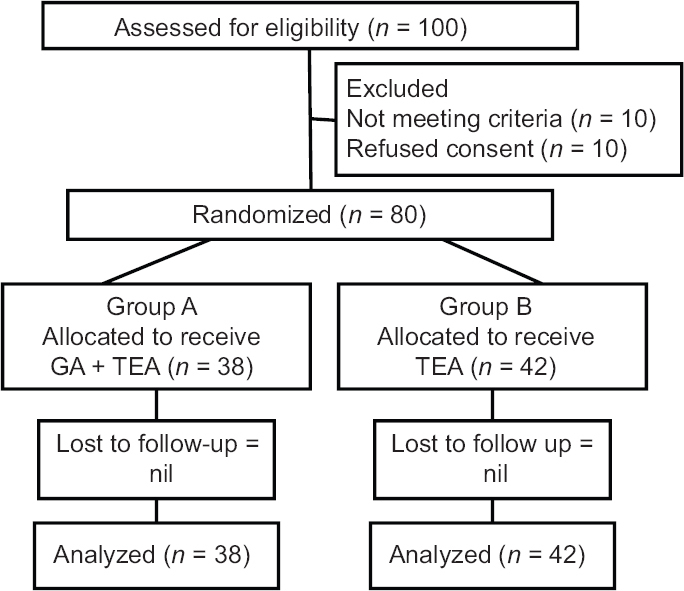 Methods: Eighty patients undergoing breast oncological procedures performed by one surgical team were randomly allocated into two groups receiving TEA and GA. The Chi-square test and Fisher's exact test were used for categorical parameters, paired t-test and Student's t-test was used for continuous measurements. Results: In comparison with GA, TEA was associated with lesser incidence of complications of nausea/vomiting. In lumpectomy with axillary node dissection, 1 out of 18 patients (5.55%) in the TEA group had nausea/vomiting, while 11 out of 19 (57.8%) of the GA group had similar symptoms (P < 0.001). The discharge rate for the thoracic epidural group was 12 out of 18 by day 3 (66.6%) while all patients in the GA group required more than 3 days of hospitalization (P < 0.001). Conclusion: Thoracic epidural anesthesia is a safe technique and its use in breast oncological procedures could improve patients' recovery and facilitate their early discharge to home. Introduction: Induction of labor is a deliberate attempt to terminate the pregnancy with the aim of vaginal delivery in cases of valid indication. Different methods are being used ranging from nonpharmacological to pharmacological for the same. Induction on demand by patients is also rising in our country. Objectives: The aim of this study is to ascertain the common indications for induction of labor at a tertiary care teaching hospital. Materials and Methods: A prospective observational study, with the study group being all the patients who underwent induction of labor and the total population including all the women delivering at our center, in 1 year. The induction was done using “Dinoprostone” gel or tablet “Misoprostol”. Results: Postdated pregnancy was the reason for induction of labor in 36% of the patients. Hypertensive disorders and gestational diabetes mellitus are other common conditions requiring induction of labor. Pregnancy following assisted reproductive techniques form an important group requiring induction of labor in present day practice. Conclusion: Hypertensive disorders and postdated pregnancy are the most common indication for induction of labor. Context: Phototherapy is the mainstay of treatment for about 3% of neonates in India who develop significant jaundice in phototherapy range. New devices have been introduced in the market over the past few years. Aims: To compare the efficacy of three types of phototherapy machines, namely Blue and White, Compact Fluorescent Lamp, and Light Emitting Diode type. Settings and Design: A non-randomized prospective interventional study conducted in a tertiary care hospital of Western India. Material and Methods: Ninety neonates with phototherapy range hyperbilirubinemia were assigned into three groups of 30 neonates each to receive phototherapy using one of the three types of phototherapy machines. Need for exchange transfusion, total serum bilirubin (TSB) at 24 hours post-phototherapy and side effect profile were recorded. Decision to stop phototherapy was based on acceptable reduction of serum bilirubin to below phototherapy range. Statistical analysis used: Medcalc® Version 11.4.2.0 Software was utilised. Comparison of mean TSB was done using one way ANOVA. P-value of <0.05 was considered significant. Results: Baseline parameters, TSB at 24 hour post-phototherapy and at the point of stopping phototherapy in the three groups was not significantly different. None of the babies required exchange transfusion or stopping of therapy. Transient rash was the most commonly observed side effect. Conclusions: The three types of phototherapy equipment studied were comparable in efficacy as measured by need for exchange transfusion and mean TSB values at 24 hrs post-phototherapy. The side effect profile was similar and was not significant enough to stop phototherapy. Background: Warts are mucocutaneous infections caused by human papillomavirus (HPV). Of the various modalities of treatment currently available, no single modality is uniformly efficacious and recurrences are common. Homologous autoimplantation is a minimally invasive procedure, which treats warts by stimulating a specific immune response against HPV. Aim: The aim of the study was to evaluate the clinical outcomes and recurrences after a single sitting of homologous autoimplantation therapy for multiple nonvenereal warts. 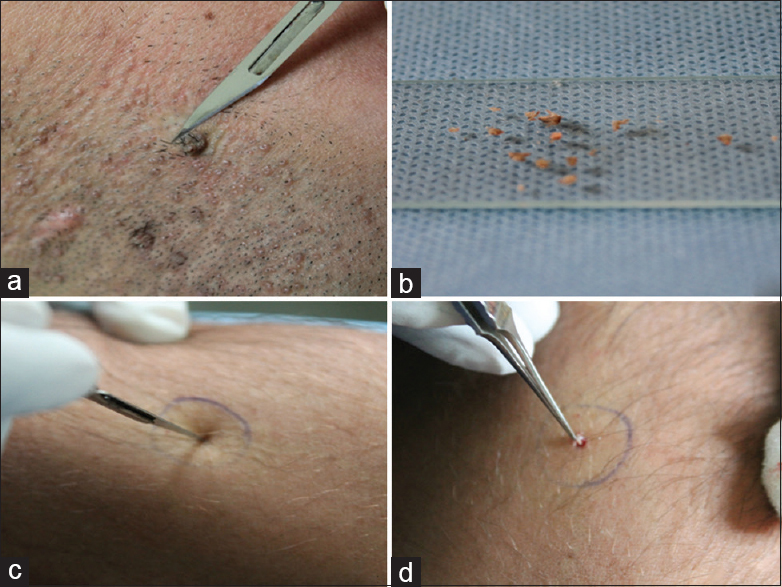 Materials and Methods: Single homologous autoimplantation of wart tissue was done in 75 patients of multiple facial, palmoplantar, or common warts, reporting to a tertiary care dermatology center. They were assessed at 3 months for the outcome of the procedure, and those with complete clearance were followed up for 1 year for any recurrences. Results: Complete clearance was observed in 30 (40%) of the cases and 10 (13.3%) cases showed moderate clearance. In 13 (17.3%) cases, there was mild clearance, whereas 22 (29.3%) patients did not show any response to treatment. Patients with facial warts showed good therapeutic response with complete clearance seen in 62.5%, compared to plantar warts, where complete clearance was achieved only in 16%. At the end of the study period, recurrence was seen in only 1 (3.33%) patient in the complete clearance group. Conclusion: Autoimplantation therapy as a one time minimally invasive procedure has moderate efficacy in treating multiple warts with the best outcome being for facial warts. The virus-specific immunity generated in the process reduces the chances of recurrences. Context: Recent times have heralded increased underwater activities both for professional and recreational purposes. There is little data regarding alteration of the nasal bacterial flora during wet and dry diving. In view of these, this study was undertaken to study the effect of diving on the bacterial flora of human nose. Aim: The aim of this study was to determine bacterial flora present in the nose of divers and changes occurring due to the effect of pressure and humidity as a consequence of diving activity. Setting and Design: A prospective observational study was carried out in a Naval Medical Center to determine bacterial flora present in the nose of divers and any alteration occurring in the flora as a consequence of diving. Materials and Methods: The participants were divided into four groups: Group I (nonswimmers); Group II (swimmers); Group III (compressed air divers); and Group IV (wet divers). Bacteriological specimens were taken from the anterior nares of all subjects as per laid down the schedule and were examined for evidence of bacterial growth and the colony characteristics were noted. Statistical analysis used was Chi-square test (Epi InfoTM). 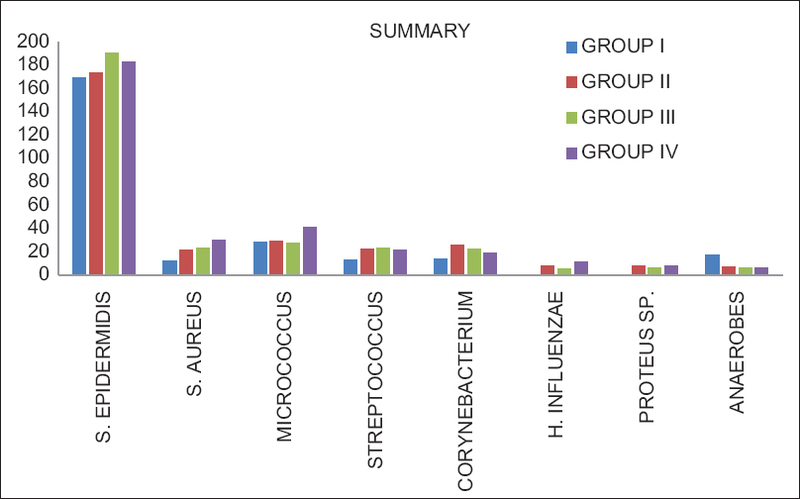 Results: Gram-positive organisms again predominated in the bacteria isolated in the various groups. Staphylococcus epidermidis predominated the nasal flora. Few Gram-negative bacteria were also isolated during the course of the study. Conclusions: There is increase in nasal flora commensals, with Gram-positive bacteria being predominant, on exposure to diving. Background: The fixation of the fracture is considered to be the best treatment option for early mobilization in midshaft humerus fracture. The aim of the present study is to compare the functional outcome after fixation of midshaft humerus fracture using medial and anterolateral plating techniques. 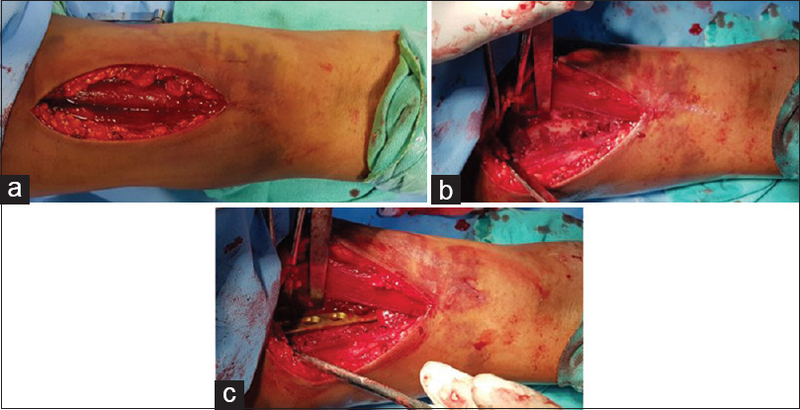 Materials and Methods: Sixty-one patients with midshaft humerus fracture were operated using medial and anterolateral plating technique. In Group A (n = 30), the patients were operated using medial plating for fixation while in Group B (n = 31), the patients were operated using anterolateral plating. The patients were assessed clinically, radiologically and using Mayo elbow score and the University of California-Los Angeles (UCLA) shoulder rating scale. Results: Both the groups were matched in terms of age, gender, mode of injury, side involved, and duration of injury to surgery. Postoperative radial nerve palsy was observed in four patients in Group B which was found to be statistically significant (P = 0.04). The mean UCLA shoulder score improved significantly, 28.53 in Group A and 29.16 in Group B at the final follow-up (P < 0.001). The mean Mayo's elbow score also improved significantly, 85.33 in Group A and 87.41 in Group B at the final follow-up (P < 0.001). There was no significant difference in terms of functional outcome at the final follow-up while comparing both the groups. Conclusion: The medial and anterolateral plating techniques for midshaft humerus have the similar functional outcome. The medial plating technique is associated with lower radial nerve injuries. Introduction: Diabetes mellitus (DM) is a metabolic disorder which affects multiple systems of the body including gastrointestinal (GI) system. A number of researchers have studied the effect of type 2 DM on esophageal motility function in western population, but there are no such studies on Indian population. Objectives: Assessment of esophageal motility functions in patients of type 2 DM and its correlation with duration of diabetes, blood sugar, and glycated hemoglobin (HbA1c). To explore the correlation of GI symptoms with abnormal esophageal motility findings. Materials and Methods: The study was conducted on 42 patients. History of three common GI symptoms was recorded. Esophageal motility functions were assessed using high-resolution GI manometry assembly. Blood sugar (Fasting and Post Prandial) and HbA1c were measured. 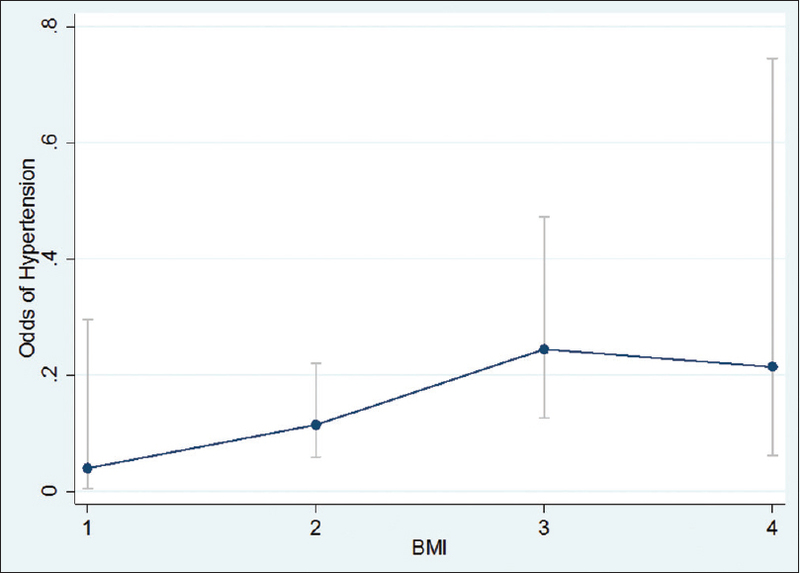 Results: In the present study, the mean duration of diabetes was 6.21 ± 4.55 year and the mean body mass index of the patients was 25.80 ± 4.93 kg/m2. Twenty-nine patients gave a history of GI symptoms. The mean HbA1Cwas 7.86 ± 1.49 and 62% patients had HbA1Cvalues >7%. Contractile front velocity (CFV) and basal lower esophageal sphincter pressure (BLESP) were the main esophageal motility parameters found to be affected in the study. About 26.19% patients had CFV more than 9 cm/s and 26% patients had abnormal BLESP. Only 5% patient had raised peristaltic amplitude. Conclusion: CFV and BLESP were the main esophageal motility parameters which were affected in the diabetic patients. The association between GI symptoms and CFV was significant. The duration of diabetes negatively correlated with peristaltic amplitude and HbA1Cvalues. Larger studies, especially in India, would be of significance to the clinicians for better symptomatic management of the disease in India. Background: Breast lesions are always a diagnostic challenge and range from benign to malignant. Fine-Needle Aspiration Cytology (FNAC) is done in patients with breast lesions. However, to get an accurate and diagnostic yield is difficult at times. Aims: The aim of this study is to highlight the role of triple approach in diagnosing breast lesions. Design and Setting: This is an observational prospective study carried out in the Department of Pathology at a tertiary care hospital over 2 years. Materials and Methods: One hundred and fifty cases of breast lump were studied. Clinical findings, imaging findings, and cytology along with histopathological findings were correlated. Results: Cytological findings were benign in 102 out of 107 patients, who were otherwise clinically and radiologically benign. In rest five patients, Breast Imaging Reporting and Data Systems (BIRADS) BIRADS II category was given on mammography. In four of these five patients, there was cytological atypia. 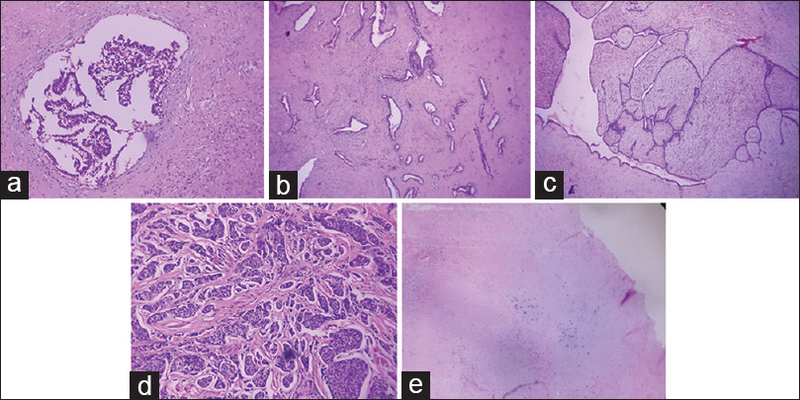 Biopsy in these four patients showed features of fibroadenoma with mild cytological atypia and one patient showed infiltrating duct carcinoma. Mammography was suggestive of malignant breast lump in 43 patients. In three patients, breast lump was diagnosed as benign on cytological examination. However, histopathological examination confirmed the mammography findings of malignancy. Conclusion: FNAC is a well-established procedure for diagnosing breast lesion but has got many pitfalls. Hence for diagnosis a breast lesion, the triple approach consisting of histopathological examination in addition to mammography and FNAC, should be considered. Tumors from remnants of the embryonic notochord are called as Chordomas. These are slow growing, yet aggressive tumors. Despite treatment, these, low grade, malignant tumors are very prone to recurrence and 6 years is approximately the median survival time. Though commonly located in the sacrococcygeal or sphenooccipital regions, their incidence in the cervical spine is around 7.5%. Treatment approaches vary from surgical excision to radiotherapy and chemotherapy. Outcome of these tumors depends on the size and location of tumour and the course of treatment delivered. Surgery is the treatment of choice with the goal to remove maximum tumor as possible and thereafter, patients are offered radiotherapy or chemotherapy. Due to the proximity of these tumors to various vital structures such as brain and spinal cord, the management requires the involvement of various subspecialties working in cohesion. 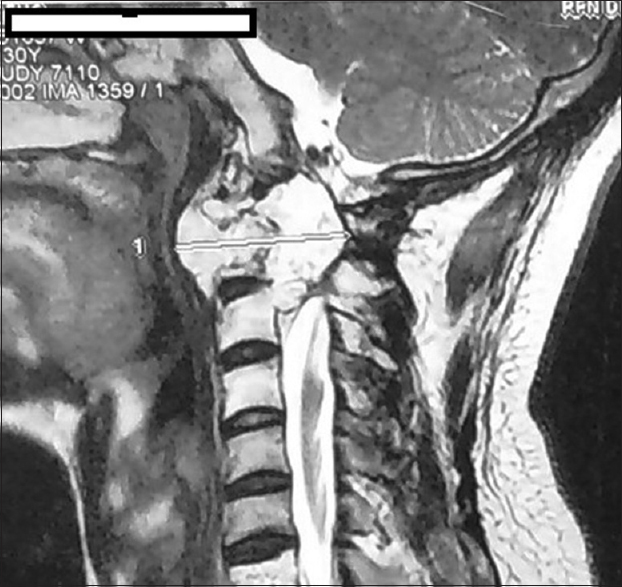 We present the anesthetic management of a 32-year-old male patient who presented with recurrence of C2 chordoma postradiotherapy and was a challenge for airway management. Idiopathic scrotal calcinosis (ISC) is a rare and benign disorder first described by Lewinski in 1883. It is characterized by the presence of multiple yellowish-white calcified asymptomatic nodules gradually increasing in size, appearing in the scrotal skin. It appears mainly in men aged 20–40 years. Histopathology ISC reveals calcium deposits within the dermis that may be associated with giant cell reaction. The calcified intradermal nodules that are seen in this condition occur in the presence of normal calcium and phosphate metabolism. Many studies done on this entity spanning over the past years have failed to demonstrate its origin. 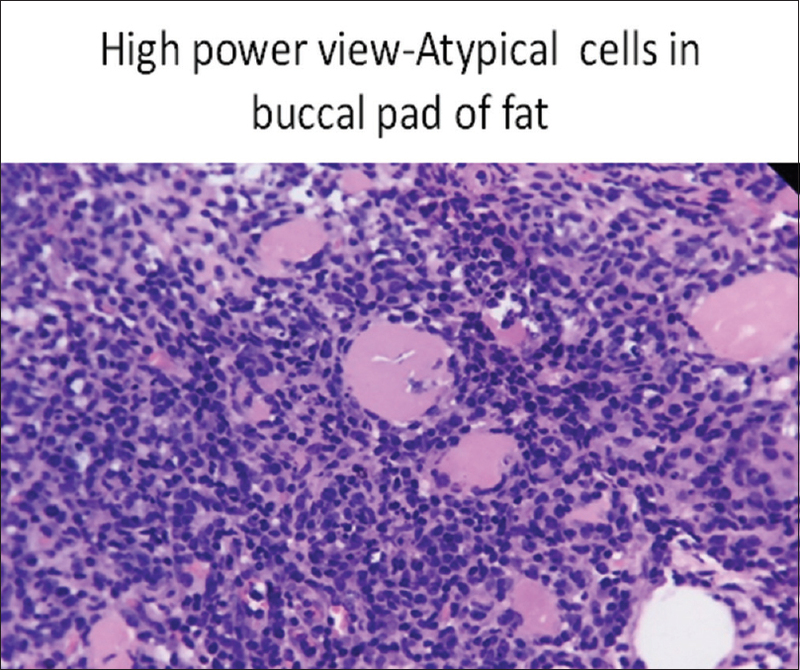 Though few studies suggest this entity to be a result of dystrophic calcification in a preexisting cyst, many other studies failed to demonstrate histological evidence to the same. Hence, whether this condition is idiopathic or as a result of dystrophic calcification of preexisting cysts including epidermal, eccrine epithelial cyst, or degenerated dartos muscle remains a controversial issue. Associations with connective tissue diseases such as scleroderma, dermatomyositis, and systemic lupus erythematosus have also been known. Surgical excision is the gold standard treatment for this disease. We report two cases, one in a 59-year-old and other in a 47-year-old male, with no known comorbidities, both presenting with asymptomatic multiple hard scrotal nodules. Both the cases revealed dermal deposits of calcium with normal serum calcium and phosphate levels. 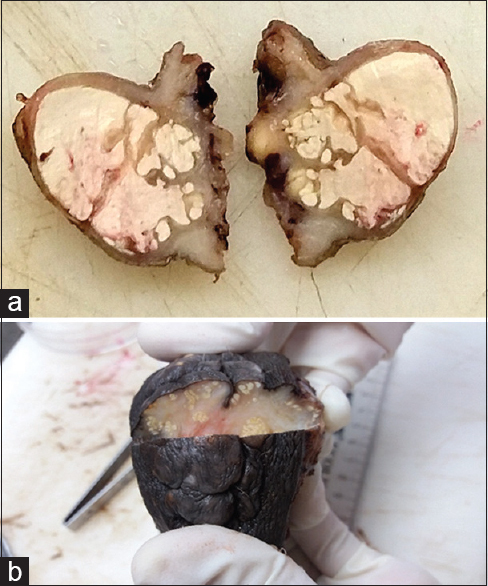 There was no evidence of keratinous material, epithelial-lined cystic spaces, or preexisting duct-like structures within or around the foci of calcification, suggesting this entity to be distinct from dystrophic calcification in a preexisting cyst. Surgical excision was done with no evidence of recurrence. Introduction: The Indian Army has been in engaged in wars, counter terrorism operations and relief work during natural or manmade disasters for a long time. An observational study of 707 casualties admitted in a tertiary care hospital was conducted to analyse tactical combat casualty care in the Indian perspective and assess the survival outcomes. Method: The study included the type of casualties, their mode of evacuation, patient survival and outcome. Results: Total 707 casualties incurred 780 wounds. All of them were initially managed at peripheral Medical Inspection Room (MI Room) and then evacuated to the tertiary hospital via road/air. Total 535 casualties were transferred by air and 172 by road. Average time taken by air was 45 minutes and by road was 3 hours and 35 minutes. Road traffic accident was the greatest contributor and averaged 76.8%. Injury distribution in our study was head and neck 2.94%, chest 1.79%, abdomen 17.94%, and extremities 77.30%. 610 injuries were operated at tertiary hospital and remaining 170 were operated at peripheral hospitals. There were three hospital deaths while one patient died at peripheral hospital during resuscitation. Discussion: We reviewed the epidemiology of military trauma to identify survival patterns from which operationally appropriate treatment strategies may be developed. Due to absence of night flying, two casualties were forced to be evacuated by road. One casualty expired during evacuation due to gunshot wound of chest and exsanguination. Patients who required surgery were operated upon within five hours, thus achieving maximum survival benefit. The study highlights the constraints in tactical combat care because of unconventional nature of conflicts and hostile terrains. However, an appropriately triaged patient can be referred for more definitive management, or if possible can be air - evacuated to the tertiary care hospital directly for better survival outcomes. Background: Altitude related diseases due to low barometric pressure and extreme cold climates are presumed to be the morbidities for soldiers carrying out military operations at altitudes varying from 2500 to 5500 meters above Mean Sea Level (MSL). Aim: The aim of the study was to ascertain high-altitude-related diseases among soldiers <50 years of age admitted in the Intensive Care Unit (ICU) of a tertiary care military hospital. Material and Methods: A study was carried out in a hospital providing tertiary care support to troops for a period of one year. Patients were diagnosed by clinical examination, laboratory rest and radiological imaging. Observations: A total of seventy three patients <50 years who suffer from diseases at high altitude were admitted in the ICU of the hospital during the study period. A total of thirty nine patients were admitted for acute coronary syndrome, twenty two patients were admitted for thrombosis-related disorders including deep venous thrombosis and cerebro-vascular accidents and twelve patients were admitted with acute high altitude related illness. Conclusion: The prevalent diseases among soldiers of less than 50 years of age in the ICU of the hospital may have been caused due to the adverse environmental condition at high altitude. Introduction: In confined afloat settings, the threat of an acceleration of the Influenza outbreak is substantial, causing high morbidity of the personnel on board, disrupting daily activities, and leading to low crew morale. In this study, H1N1 Influenza outbreak in a Naval Warship and its control measures are described. Materials and Methods: It is a study of 21 clinically suspected cases of H1N1 Influenza. Cases were reported within 3 weeks from a ship company, all of whom were susceptible. They have been described on the basis of demography, clinical features, recent travel history, and history of contact. Results: Mean age of the clinically suspected cases was 26.71 years. 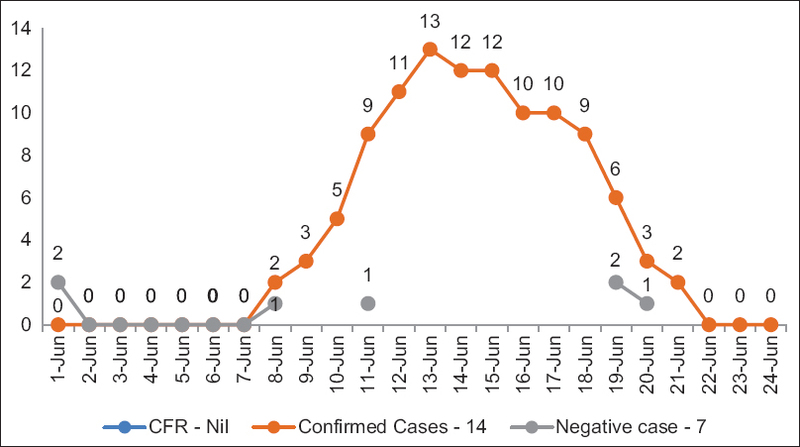 Of 21 suspected cases, 14 were found positive for the disease. Nine cases were admitted to the hospital and two developed complications. Attack rate of the disease was 4.83%. Conclusion: In confined afloat settings, prompt public health measures of active case finding, strict isolation, and adherence to hand hygiene, following cough etiquettes and disinfection enhancement, can effectively mitigate the outbreak. Vaccination may not have a role to play if preventive measures are instituted effectively. 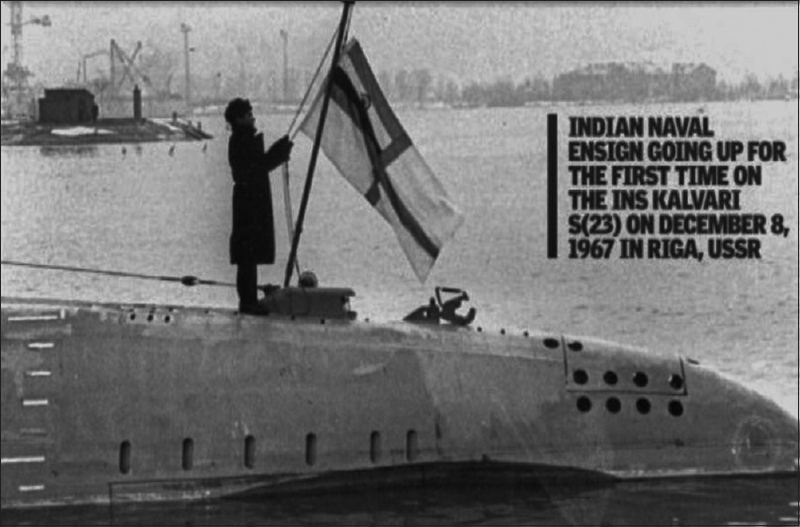 The Submarine arm of the Indian Navy is in its Golden Jubilee year, celebrating 50 glorious years of service to the Nation. From a small force of Foxtrot class, it leapfrogged into high technology boats in just 25 years of its coming into being. Forays into operating a nuclear Submarine have brought the Navy into the fold of of modern Submarine powers. In this journey, it has also graduated from acquiring Submarines from foreign nations to the present day indigenous construction of both conventional and nuclear boats. Submarine Medicine has been an inseparable part of strengthening the Naval capability throughout this endeavor. 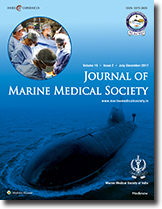 This article briefly describes the tale of Submarine medicine in India since its origin, highlighting significant milestones. Facial swellings could arise symmetrically due to underlying congenital; or acquired disorders such as renal, cardiac, endocrine, or storage disorders, mostly the manifestations of systemic illness in the face. It requires a high index of clinical suspicion by an alert clinician to distinguish the emergency and diffuse inflammatory causes as in lymphedema, hay fever, etc., or an abscess or dental etiologies which are mostly well lateralized from long-standing causes which may be vascular malformations, fibrous dysplasias or slowly progressive and sinister swellings due to malignancies. These cause significant distress to both the patient and the treating clinician. This case highlights the need to look beyond the usual or common causes since these underlying diseases may be sinister yet highly treatable and ameliorate the patients' symptoms dramatically. This case highlights a mature T-cell cutaneous lymphoma who presented repeatedly with little relief from treatment initially offered.